Each spring, Latter-day Saint women across the globe meet together to celebrate the founding of the Relief Society by the Prophet Joseph Smith on March 17, 1842. This year we celebrate the 174th anniversary of this amazing organization. Often we celebrate this special event by holding a ‘Relief Society Birthday Party’. Every birthday party needs an invitation, right? 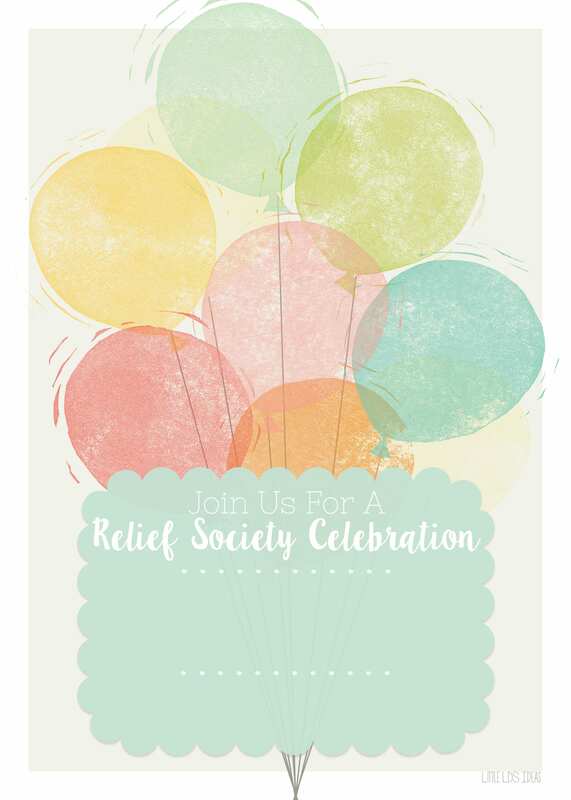 Today I am sharing just that…a Relief Society Birthday Invitation that you can use for your very own Relief Society Birthday Celebration. Hope you like it! I decided to create an invitation that would work for any birthday celebration. You can’t go wrong with balloons. 🙂 I love the water color balloons that I used for the invite. I found them on Etsy from a shop called Dinny’s Garden. The other option has a completely blank text area. You can add your own title and information. The fonts that I used for my invitation is Nixie One and LillyBelle (one of my favorites). I had chosen a different font instead of Nixie, but I just shared a video tutorial on ‘How to Edit Using Canva’ and unfortunately they didn’t have the font that I originally used. BUT they have the Nixie One font, so you can download my invite and edit it with Canva, easy peasy! Click HERE to download my Blank Relief Society Birthday Invitation! You can view my video tutorial, HERE! If you need to edit the printable using Microsoft Word, check out THIS post! And, if you need to edit this on a Mac, check out this Video tutorial! I hope you enjoy my Relief Society Birthday Invitation and use it for your celebration. And I hope my tutorials are helpful, but if you have any problems just send me an email or leave me a comment and I will do my best to help you out! None of the downloads are working, am I doing something wrong? I would like to use your RS birthday cupcake toppers. Can you send me the link, I can’t find it. Hi Janice! I don’t think I have shared any cupcake toppers, but if you have something that you’re looking for I can create some for you. Feel free to email me at sheena@littleldsideas.net. Thanks!